Weeknight Instant Pot Parmesan Risotto! Yes, you can have risotto on a weeknight! The secret? The instant pot! This Weeknight Instant Pot Parmesan Risotto is ready in under 30 minutes and so good you may never make regular parmesan risotto again! Creamy, rich and luxurious it is everything you love about risotto without the stirring! 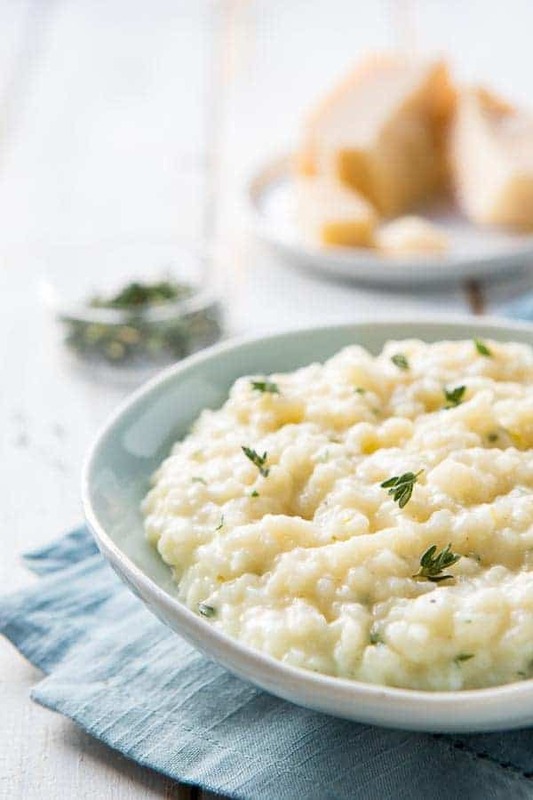 Italy has given us many wonderful dishes and parmesan risotto is one of my favorites. 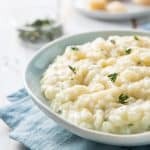 When I think about comfort food, parmesan risotto is right at the top of the list – creamy, silky and cheesy with that wonderful chewiness, it represents everything I love and admire about Italian cuisine – simple ingredients combined with stellar technique. But often that technique means long cooking times – especially for dishes like this parmesan risotto. But not anymore! Cue the Instant Pot! 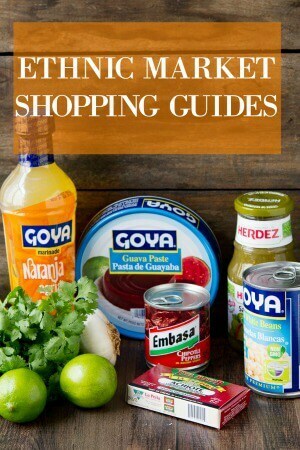 Yes, the Instant Pot! Believe it or not, risotto is ideally suited for the Instant Pot! 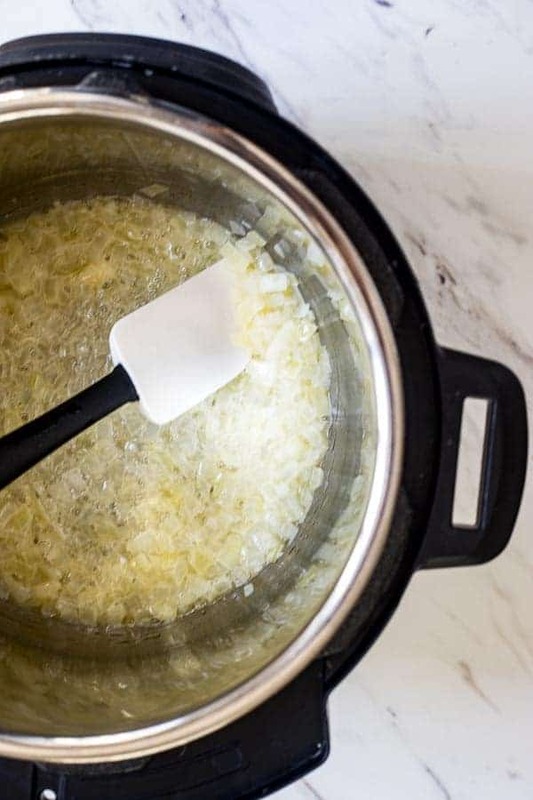 Truth be told I was skeptical at first, but after making a few batches, I was convinced and I think after tasting this Weeknight Instant Pot Parmesan Risotto you will be too! What type of rice do you need to make parmesan risotto? 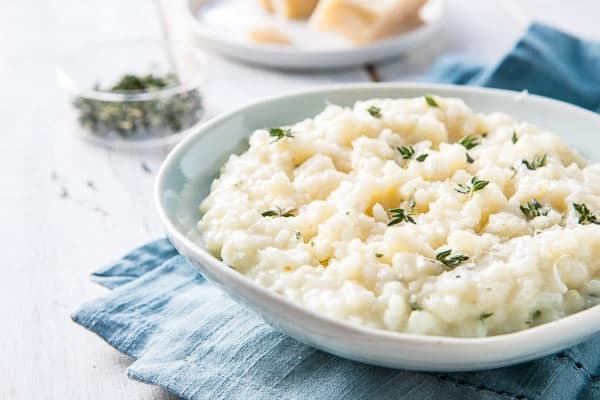 Rices such as basmati and long grain white rice don’t have enough starch content to create that luxurious creaminess that is the hallmark of a good risotto. If you can’t find Arborio, sushi rice does work although it doesn’t have the same texture as Arborio. 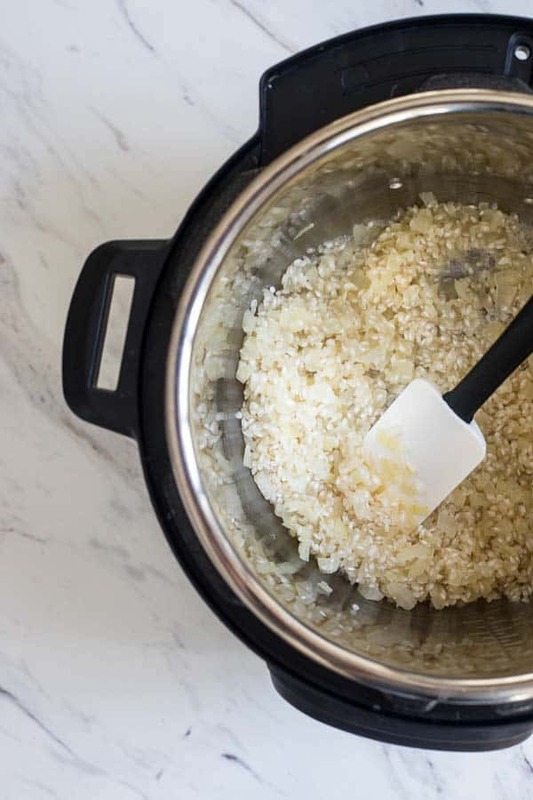 How do you make this Weeknight Instant Pot Parmesan Risotto? Step 2: Add the wine and cook until almost all the wine is evaporated. This is a crucial step because there is very little evaporation with a pressure cooker. 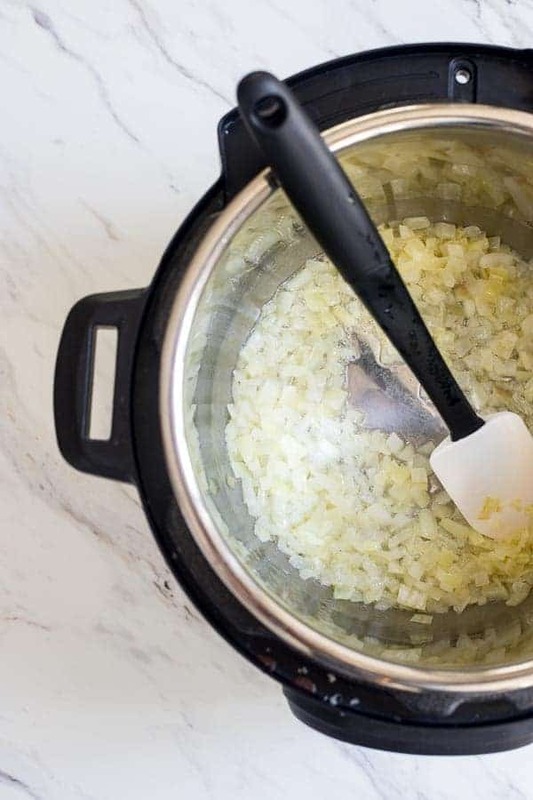 Skipping this step results in a strong alcohol flavor in your risotto! Step 4: Add the stock and a few sprigs of fresh thyme (if you want!) and then put on the lid and cook on manual for 6 minutes. And then sit down to a creamy bowl of this Weeknight Instant Pot Parmesan Risotto! This parmesan risotto would pair wonderfully with this Shrimp with Crispy Pancetta, Tomatoes and Rosemary or with these Yogurt,Lemon and Mint Grilled Chicken Breasts. Think a good parmesan risotto is out of reach on a weeknight? Think again! 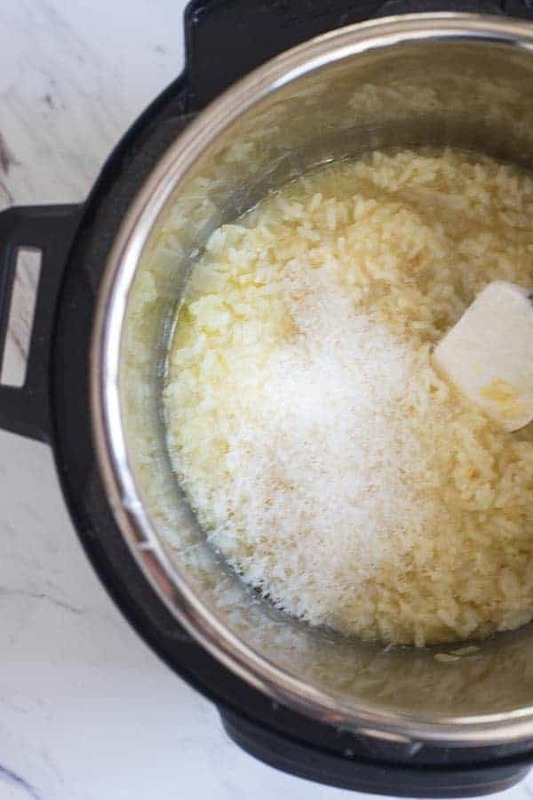 This Weeknight Instant Pot Parmesan Risotto is ready in under 30 minutes - you may never make regular parmesan risotto again! Creamy, rich and luxurious it is everything you love about risotto without the stirring! Set the instant pot to medium saute and melt the butter. Add the onions and saute until the onions are soft and translucent about 6 minutes. Add the white wine and cook until almost all the wine is evaporated. until the edges of the rice are translucent, about 2 - 3 minutes. Add the rice and saute until the rice is translucent around the edges. Add the chicken stock, pepper and thyme sprigs and stir to combine. Add the lid and press manual. Set the timer for 6 minutes. After 6 minutes, follow the manufacturer's directions for a "manual" release. Remove the lid from the instapot and stir the risotto. Remove the thyme stems and stir in the parmesan. Taste and add salt and pepper if needed. Portion between 4 plates or bowls and serve, passing additional parmesan if desired. If you like a looser risotto, add an additional 3/4 cup stock. If you like a firmer risotto, once you have removed the lid after cooking, set the Instapot to Saute and cook, stirring frequently, until the desired consistency is reached. 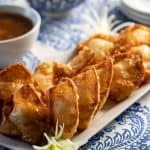 Nancy, I am making this recipe in my shiny NEW instant pot…looks super easy and delicious, thank you for sharing another awesome recipe. The photos looked so wonderful that I tried it with lunch today. Very rich and tasty. It went great with some leftover salmon from dinner last night. 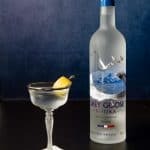 Can this recipe be doubled if the amount measure under the capacity line? And if so do you increase the cook time? Ooooohhhh… that’s a great question!!! I have not personally tried doubling the recipe so I can’t give you a “tested” answer. However, if the ingredients fit, I see no reason that you couldn’t easily double the recipe. Here’s where it gets a bit tricky though. 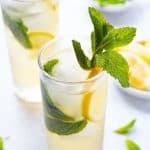 While the pressure cooker is getting up to pressure, it is cooking the ingredients – so with a larger volume, it will take a bit longer to come to pressure. Therefore I would keep the cooking time the same and then after you’ve done the manual release I would check it. If it’s perfect, I’d remove the insert and place it on a cooling rack to stop the cooking process. If you feel it needs a bit more time, you could switch to the saute function (low) and stir the risotto until you have the texture you prefer. With risotto, some people like it more al dente while others like it less so – mine I believe falls somewhere in the middle. Now of course, I have to try increasing the recipe to know for certain!!! 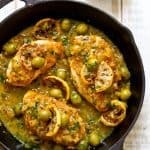 Hi, I am not a good cook but trying, I found this recipe and I am literally cooking it now! I have one comment, where does it say put in the arborio rice? This might seem logically to those that cook, but I am a total novice! I have just guessed and thrown it in with butter and onions…hope it turns out ok! EEK! I can’t believe I forgot to add in the rice! THANK YOU for letting me know! Putting the rice in with the butter and onions is fine. The key is to cook off the wine so the risotto doesn’t have a strong alcohol flavor! Let me know how the risotto turned out! Question: pictorial directions have the wine in before the rice, written directions have the rice in before the wine. Which is correct? Can I hire you as my proofreader? 🙂 The correct method is to add the wine first! When I adapted the recipe for the Instant Pot I changed it. When I make it on the stovetop, I always add the wine after adding the rice, and since there is more evaporation, the alcohol taste isn’t there. but I found with the instant pot I needed to add it before to reduce it as much as possible- otherwise, I could still taste the alcohol! 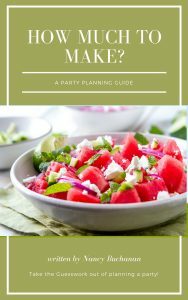 Thank you for alerting me to this – I’ve gone in and changed the recipe card so it tracks with the pictorial directions!! Thanks!! Made it tonight—it was fabulous!! I am so glad you liked it! Definitely beats 45 minutes of stirring!!!! This was SOO delicious! I did double the recipe as asked about above. It needed just a few more minutes on saute after the cooking time and it was perfect! Thanks for a much more elegant taste than other risottos I’ve attempted! I can’t tell you how happy your comments made me!! I am sooo glad you enjoyed the risotto and I agree..the Instant Pot is one of the best things ever!!!! I have the Instapot DUO60 and it doesn’t have a Manual function. Which function should I use instead? Thank you in advance for your help! Hi Laura! First off, my apologies for not responding sooner. My comments filter has gone a bit wonky and yours ended up in Spam :-(. So to your question – I checked your model and it’s supposed to have a manual setting on the main keypad. But if it doesn’t, use the “pressure cooker” setting!! I hope this helps and that you enjoy the risotto! The biggest issue is liquid and fine tuning it to give you the amount of liquid you like in your risotto. I’m finding that not everyone likes theirs the same – some like it wetter and some drier. So, IF yours comes out wetter than you like, switch to saute when the risotto is done and stir for a couple of minutes. If it’s drier, you can stir in a bit of water!